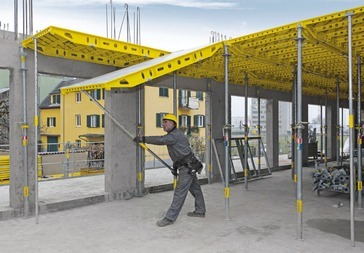 Dokadek 30 is a beam-less, hand-set formwork system designed as a lightweight steel construction with yellow coated frames faced with a wood/plastic-composite sheet. 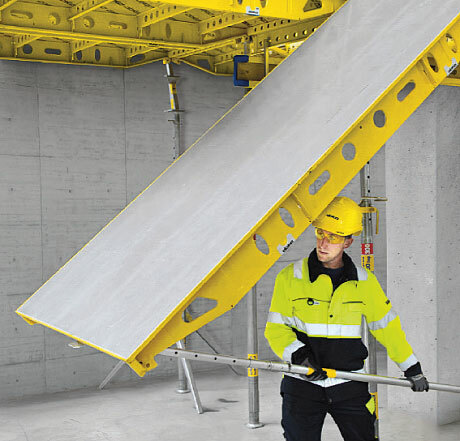 Dokadek 30 combines the advantages of a panel floor formwork system with those of Dokaflex floor-slab formwork, that means its 3 m² large panels make it fast in typical zones, yet – thanks to Dokaflex – it is also quick and flexible in the infill zones. 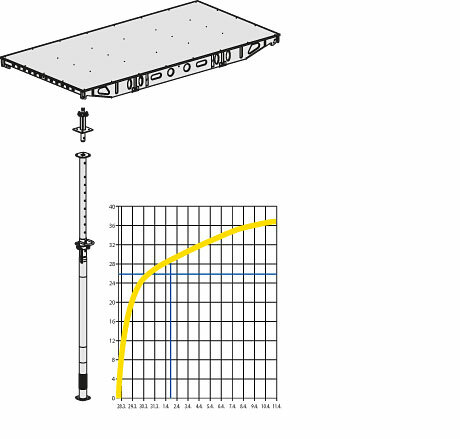 Dokadek 30 - with or without drop-head: Slab formwork at its most evolved. The galvanised, yellow coated steel frames of the panels, with riveted-on Xlife sheets, are long-lived and permit many re-use cycles with no change of form-facing. The small number of joints and the neat joint pattern, with a uniform concrete finish, make it easy to achieve great results, time after time. The standard head for holding the panels firmly. 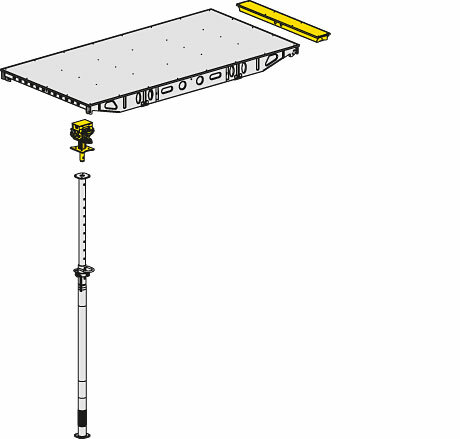 The integral anti-liftout guard prevents any of the panels accidentally falling off, and makes extra precautions (such as wind bracing) unneccessary. and additional closure panels make it possible to perform early stripping of the panels. 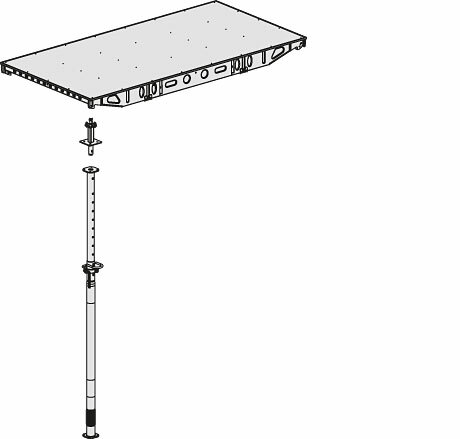 Here too, the integral anti-liftout guard prevents any of the panels accidentally falling off, and withstands even stronger gusts of wind. Easy, back-friendly working, from floor-level. The working posture is generally upright – with Dokadek 30, frequent bending down and inserting panels from above are a thing of the past. Even the job of removing the panels can be done without any laddering; strenuous overhead work is reduced to an absolute minimum. because this operation takes up around 33 % of the total forming time. With Dokadek 30, the panels are stripped out without any time-consuming overhead work. 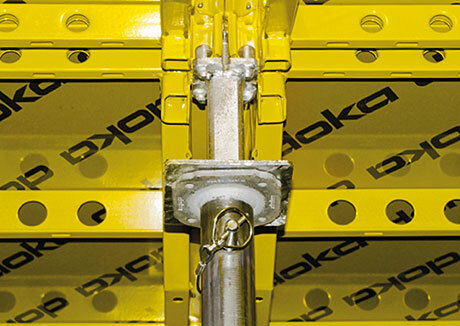 The DekDrive then lets you shift up to 12 m² of Dokadek 30 at a time. 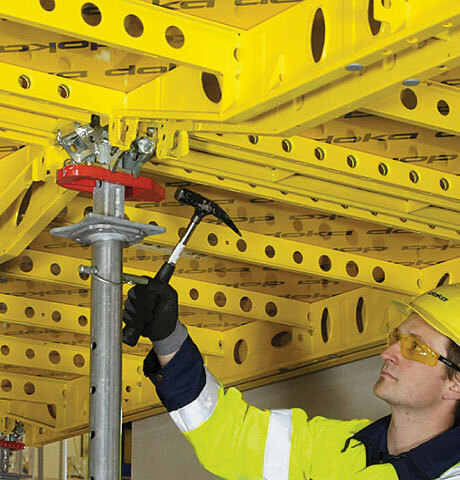 The clearly defined erection sequence prevents the crew from attempting dangerous improvisations, and ensures a consistently high safety level – even when semi-skilled labour is deployed. Because of the number of props and how they are arranged, with Dokadek 30 there is no need to dimension the system in advance. 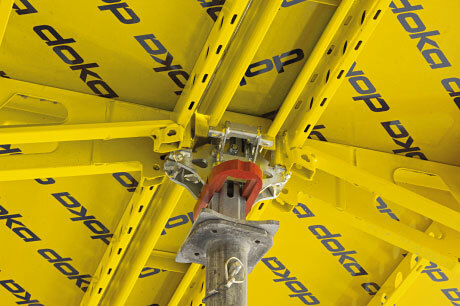 Dokadek 30 is fully compatible with the Doka edge protection system XP. This brings an added dimension of safety. 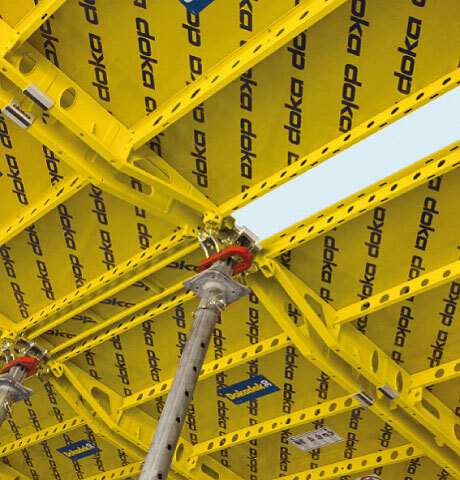 When the panels are hung into place, the Dokadek heads ensure that they engage safely and are firmly fixed. 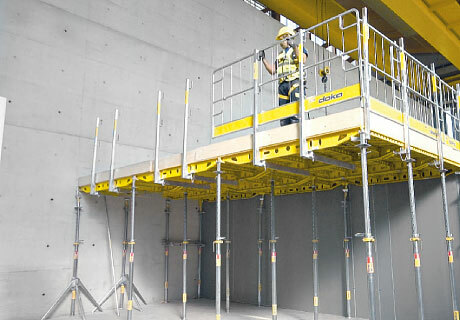 At the usual heights, the free ends of the panels are raised with the Dokadek assembling tool, while at greater heights the DekLift 4.50m is used. ... by the second man. 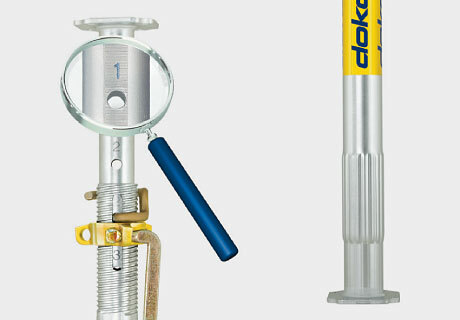 The Doka floor prop Eurex 30 top is a rugged, tried-and-tested product. And with its high thread pitch, it can be backed off very easily at a later stage – even when it is under full load. 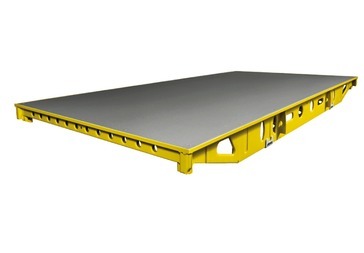 with no strenuous overhead work, and from the safety of floor level. With the formwork-removal procedure made possible by Dokadek 30, overall forming-times can be greatly reduced. This brings added productivity. and fit the floor props. 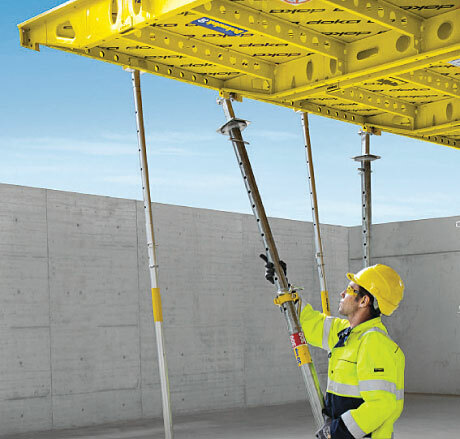 For the 'without drop-head and with proof of concrete strength' method, Dokadek 30 is erected in the same way as for Method 1.
based on proof of actual concrete strength. 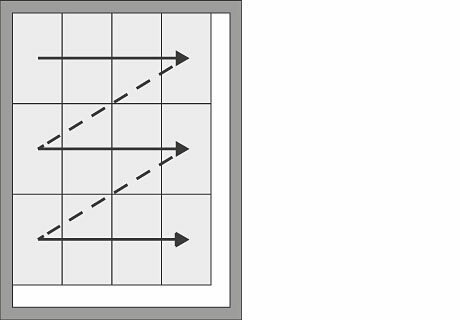 In practice, the release strength can be verified with the following methods: test cube, rebound hammer and maturity calculation. 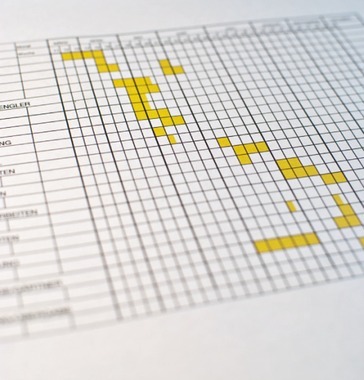 Stripping is carried out based on measured data. 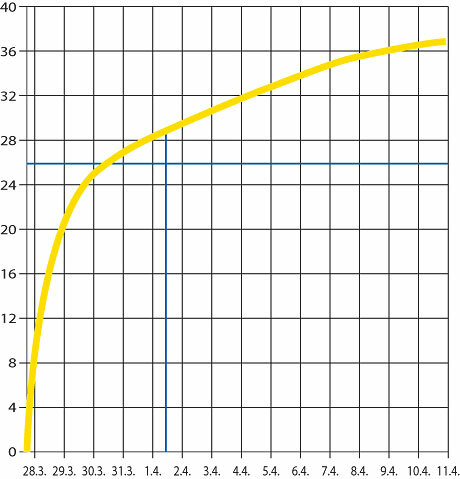 The actual strength values obtained in Step 2 can be used to determine the earliest possible time of formwork removal. This speeds up the construction process. Engage panel – raise free end – put up props. 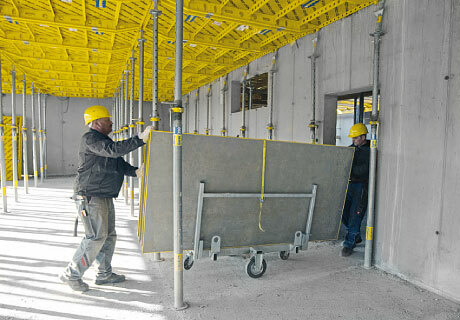 In the 'Dokadek 30 with drop-head' method, too, the formwork is set up safely and easily, working from floor-level. The closure panels are then inserted from above, but because these are so narrow (only 15 cm wide) there is no need for any additional fall-hazard precautions. Reclaim equipment for re-use much sooner: Hammering on the red lowering wedge quickly detaches the panels from the concrete, then tilt down and remove the panels, and take out the closure panels; these items can now be re-used in the next casting section. 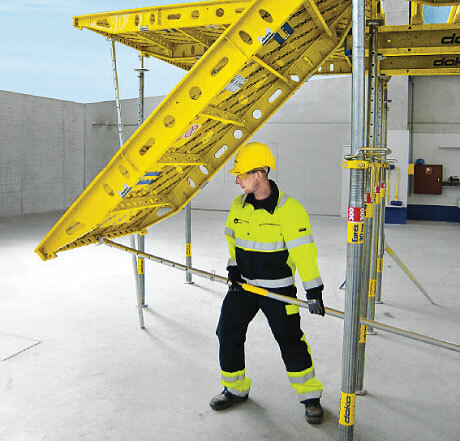 Safely supported – right to the end of the job. 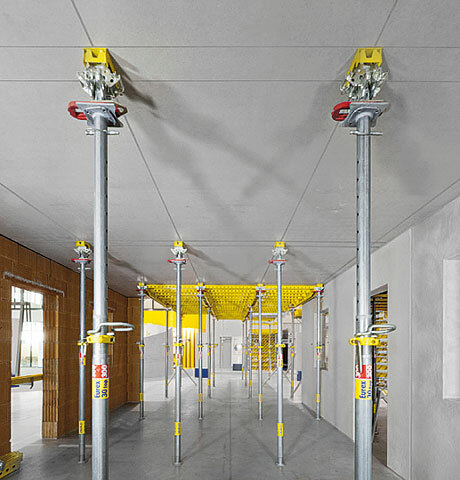 The floor-slab stays safely shored with the Doka 'Eurex 30 top' floor props until the required concrete strength has been reached. Thank you for your interest - Panel floor formwork Dokadek 30. Thank you very much for your interest - Panel floor formwork Dokadek 30.